The statistics are a little scary. In 2017, a survey from the Association for Pet Obesity Prevention found that 56% of dogs in the US are overweight or obese. You love your pups and don’t want to put them at risk of disease, so you’ve got to keep them active. Why not join in the fun? Your dog isn’t the only one who needs exercise. Try one of these eight different ways to get fit with your dog. Skip the namaste home with my dog and take your best pal to a yoga class. Yes, there are joint pup and human yoga classes. Google your city name with “dog yoga class” to find one near you. Not only is the calming practice relaxing for you and your pup, but it gives you a chance to bond through a healthy lifestyle activity. 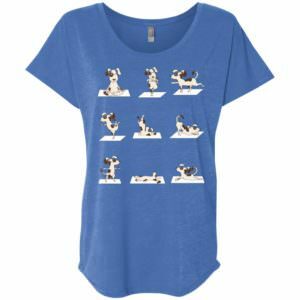 And if that isn’t incentive enough to try a class, show your puppy pride with a cute yoga shirt. If you’re not one for yoga, how about a doggy dance class? If you like it enough, you and your pup could enter a dog dance competition. 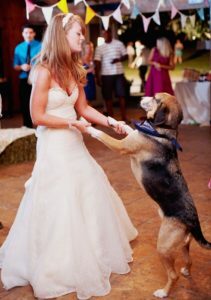 Okay, if you’re not ready to escalate the hobby to those levels, you can still teach your canine companion to dance with you. If you’re really jazzed on the idea, try reading Dancing with Dogs by Mary Ray to get started. The next time you head out on the trail, bring your dog along. 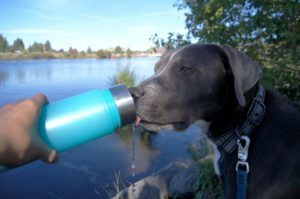 Purchase a leak-proof water bottle to keep your pup hydrated along the way. One word to the wise: if you bring your dog to an area known to have ticks, make sure to get a preventative medication from your vet and think about how much exercise is right for your pup. Don’t forget the poop bags and make sure your dog is wearing their collar and ID tag in the event you get separated. Are you a runner or training to become one? Your dog would be the perfect companion to take on the trails. Before you go on your first adventure, remember to check with your pup’s vet to make sure the activity is suitable. 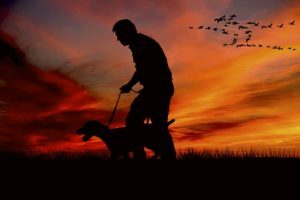 Consider buying a hands-free waist leash to make your life easier and/or a harness to make your dog more comfortable. Be mindful that your dog isn’t a superhero. 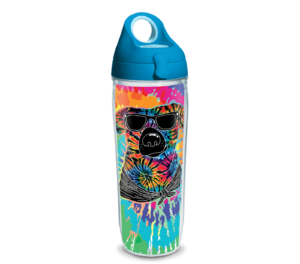 These are the signs of dehydration to look out for during exercise. Find some calm waters and take your dog for a ride on a stand-up paddleboard. Try it a few times without your pup to lower the risk of toppling over when you have precious cargo. Train your dog to ride the board. Bring along some treats to reward her for good behavior. Practice in shallow waters before going for a long adventure. Protect your dog in the event they jump off the board with a life jacket. Then – have fun! If you’re already a fan of camping, why not bring along your dog for the fun? Or, if you’ve never tried it, give one night in the great outdoors a shot with your best pal. 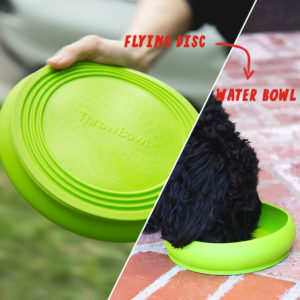 Bring along your leak-proof dog water bottle and get the Throw Bowl – the collapsable bowl that doubles as a flying disk you can use to play fetch. Bonus: a dog toy is donated to a shelter with each purchase. Like we mentioned before, it’s important to talk to your vet before you go on this type of trip because they should be up-to-date on vaccinations and medication before traveling. The American Animal Hospital Association says to bring along your dog’s crate if she is crate trained to make her feel secure. Another tip for humans and dogs alike: bring bug spray to keep insects away. When the weather permits, take your dog to a doggy beach. You can play fetch with a ball launcher in the water or along the shore. 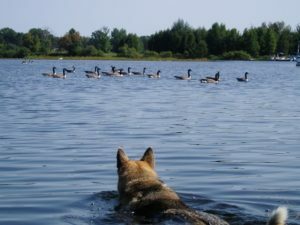 Chase after your dog in the water, walk across in the sand and let your dog play with other pups. Make sure your dog is wearing his collar with ID tag. And don’t forget to bring lots of towels. You may want to line your backseat with them so your pup doesn’t track grains of sand into your vehicle. Walks are Dog 101, but that doesn’t mean they are any less enjoyable than swimming or hiking with your pup. Maybe there aren’t trails or a dog beach nearby. Maybe you aren’t a fan of the great outdoors. That’s okay, Go back to the basics. Attach a leash to your dog’s collar and take a walk around the neighborhood, through a nearby park, or around the block. Bring your dog to an empty basketball court or soccer field and play fetch. If you meet a friendly dog and human pair along the way, invite them to walk with you. One of the best parts about having a dog (there are too many to list!) is meeting other dog enthusiasts. You and your dog could make new friends. Sometimes exercise is a major pain. But taking care of your dog rarely is annoying. Eliminate the struggle of exercise by bringing along your best friend. Use these ways to get fit with your pup and you’ll both be feeling fine.